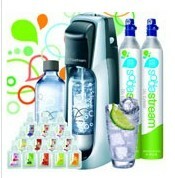 Soda Stream is a great way to have your soda and drink it too. I LOVE me some soda, and drink it all day long. I was very skeptical that the Soda Stream system could provide a tasty soft drink, but I was wrong. In several shakes of a lamb’s tail, my dear wife can produce lemon-lime, cherry, coca cola, root beer, and every other flavor that my taste buds desire. It’s simple enough that even I can do it, and I am the original Luddite, normally totally incapable of using even the simplest technology. And the price is certainly right, less than 1/4 of what equivalent soda sells for in the local supermarket. Well done, Soda Stream, you have won my heart!!!! !